BlackBerry just recently made the official announcement about the details of their upcoming iPad rivel tablet, named BlackBerry PlayBook.The all new BlackBerry PlayBook comes with a lot of exciting and top features that makes it possibly challenge Apple iPad and Samsung Galaxy Tab.The new PlayBook tablet will hit market by early 2011. 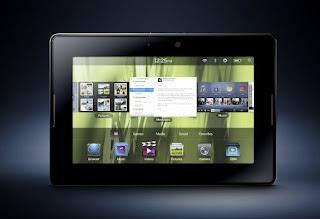 The all new BlackBerry PlayBook tablet comes equipped with a 7-inch LCD WSVGA, capacitive touch screen with 1024 x 600 pixel resolution and has full multi-touch and gesture support.The tablet is powered with a 1 GHz dual-core processor and a 1 GB RAM modules makes its the most powerful tablet launched. New BlackBerry PlayBook tablet comes housed with 3 MP front and a 5 MP rear HD cameras that has 1080p HD video recording.Other Features of BlackBerry PlayBook tablet includes Wi-Fi 802.11 a/b/g/n, Bluetooth 2.1 + EDR, 1080p HD Video playback, Audio playback(MP3, AAC, WMA), microHDMI and microUSB Connectors.The new BlackBerry PlayBook tablet also has supports for WebKit/HTML-5, Adobe Flash Player 10.1, Adobe Mobile AIR, Adobe Reader, POSIX, OpenGL, Java. The thin, portable BlackBerry PlayBook tablet weighs about 400g and its dimensions are 130mm x 193mm x 10mm.BlackBerry is also planning a future introduction of 3G and 4G models. 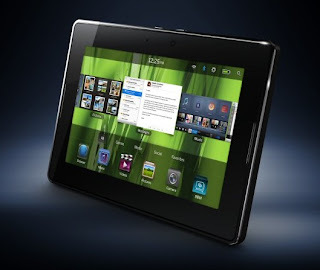 Anyway if you are planning to buy one new BlackBerry PlayBook tablet you need to wait till the beginning of next year 2011. Tags:-BlackBerry PlayBook tablet review, BlackBerry PlayBook tablet preview, BlackBerry PlayBook tablet detailed specifications, BlackBerry PlayBook tablet features, BlackBerry PlayBook tablet specs, BlackBerry PlayBook tablet release date, BlackBerry PlayBook tablet launch date, BlackBerry PlayBook tablet availability, BlackBerry PlayBook tablet camera, BlackBerry PlayBook tablet pics, BlackBerry PlayBook tablet images, BlackBerry PlayBook tablet preview, BlackBerry PlayBook tablet.